Please bring your kids and neighbors to this free event to meet our next Representative to the United States Congress! Co-hosting is Harriet Applegate, head of the North Shore AFL-CIO. The Democratic Party recognizes that unions helped build the middle class, and it will stand with unions to fight for American workers. 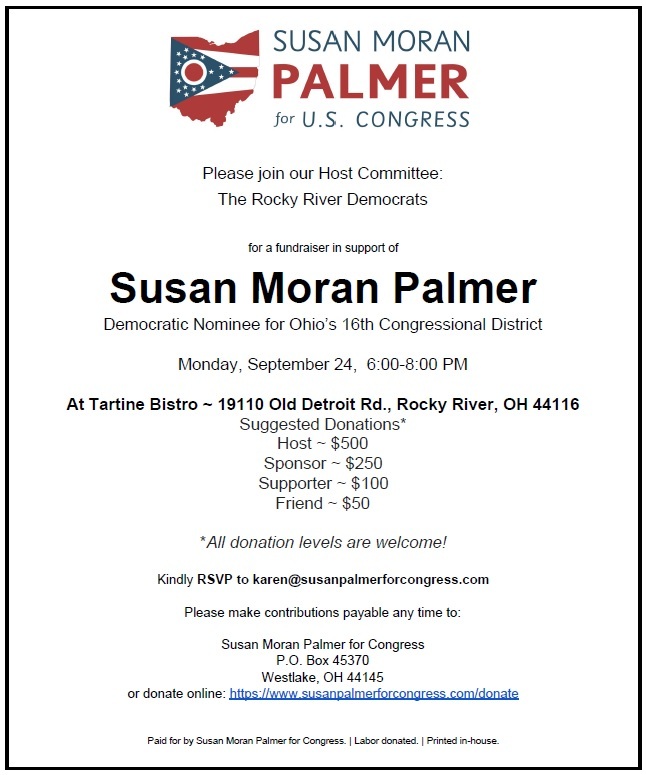 Our Congressional District 16 (Fairview Park, North Olmsted, Westlake, much of Rocky River and beyond) is Ohio’s only open congressional seat contest. With your support, our chances are very strong that Susan will replace Jim Renacci and represent our values in Congress. Susan is facing a well-funded opponent. Nearly 90 PAC’s including KochPac, Mike Pence’s and Paul Ryan’s Pacs are contributing to her Republican opponent. If you can make a contribution at any of the suggested levels, or any amount, it will help Susan counter their influence. 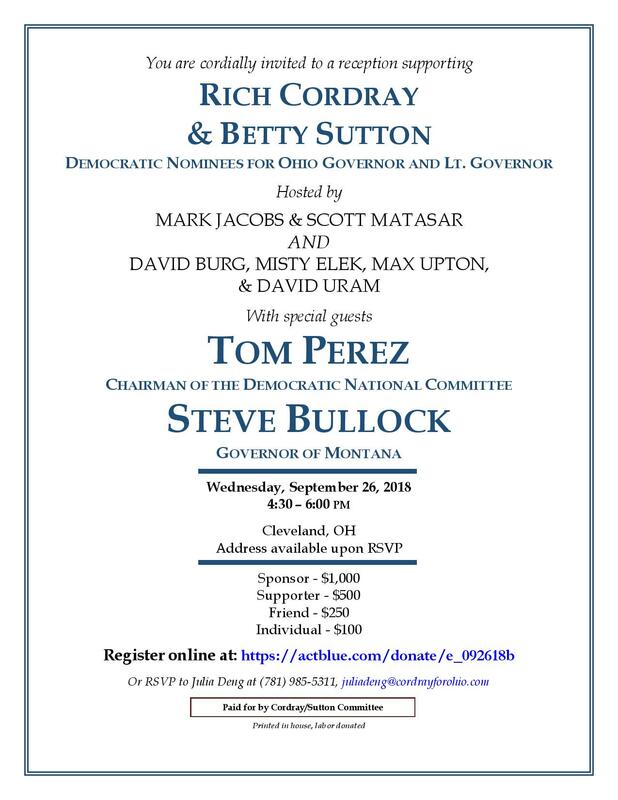 Richard will be joined by Tom Perez, Chair of the Democratic National Committee and Steve Bullock, Governor of Montana. By all important measures such as job growth and education, Ohio has declined under the state’s Republican leadership. Richard Cordray and Betty Sutton will bring the change that’s needed to improve the lives of all Ohioans. SAVE THE FOLLOWING TWO DATES! Everyone is welcome to attend the free Meet & Greet. Please bring your children and neighbors to meet our next Representative to the United States Congress! If you’re inclined, contributions will be accepted to help Susan buy airtime, ads and other means of communicating her message. Contributions can be any amount you are comfortable giving. All contributions add up! Congressional District 16 encompasses Westlake, Fairview Park, North Olmsted and much of Rocky River. Democrats must succeed in winning Congress or the country faces two more years of further damage by Trump and his Republican enablers. If you previously voted by mail, you should have received your ballot application. Please remind friends and family to look for theirs. If you have not voted by mail in past elections, and would like to do so for the November midterm elections, please click HERE to go to the Cuyahoga County Board of Elections for the application and complete information. If you’re unsure of how to make a difference in this critical election year, please attend the meeting on September 25th or send an email with your thoughts and questions to: submit@rockyriverdems.org Our energy and impact is multiplied when we work together. Thank you for being a part of the team that will make a difference in November to bring balanced Government back to our great country. © 2019 Rocky River Democrats. All Rights Reserved.